Cognition is the act or process of knowing; awareness and judgement. Well, the cover pretty much tells you what you're going to get here. How to describe it... psych rock, prog-rock, prog-pop...? Anyhow, if you dig in, you definitely need to be in a cosmic mood today. In fact, this is a request from a good friend. So here it is, Johnny! A Kama Sutra 2-record set* with lots of twists and turns in a prog-rock atmosphere that never abandons a pop and melody sense nevertheless. Very listenable. So, take off your t-shirt, lower the lights, free your mind and take control of the galaxy and beyond! Imagine yourself, feelin' as high! Francesc, Just wanted to say Thank You so very much for this LP. My Lp was ruined by a flooded basemaent some years back. I thought the only way that I would ever get to hear this again was by purchasing it from a used record store. Again, Thank You my friend for making this available to my happy ears. Thanks so much for the great Road album. Any chance you have their first with "She's not There"? Sorry, that's all I have from them! Wow. All I can say is wow. I had this record for many years and thought it was long gone until the other day I found it in storage. I had forgotten the sheer pop greatness of this album. THANK YOU so much for making it available to download. Hi: I'm John Lotz. 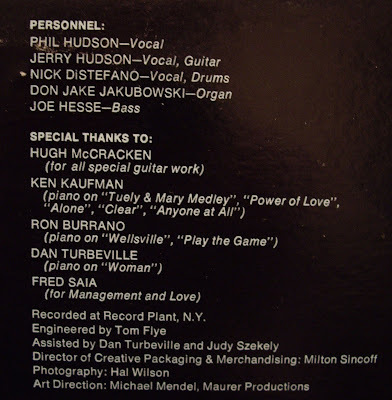 Ken Kaufman and I wrote 4 of the songs on the album. Tuley and Mary, Tuley's Day, Anyone at All. Want to go Clear. Thanks for making this and other albums available for download. I think that along with the Raven, The Road is one of the classic Buffalo groups. I still listen to the album and I think it still has a lot to say. My favorite song is Make you See by Ronny Burrano. I always thought an edited version of about 2 minutes, would have been a hit. Ken and I have spoken about finishing the rock opera "Tuley and Mary". It might still happen. Thanks all for the nice words about the album. Hi My name is Joe Hesse. I played bass on this album and lost it years ago. If you have one you want to sell let me know. This was a big album in Buffalo N.Y. in the early 70's. Where did you get this? Very glad to hear from you! My cousin Carl Mirabella played with the ROAD in the 70's and I always wanted a copy of their two alblums. Any idea where I can get copies? Please let me know. Thanks!! Thanks for your message, Rick. I got my copy in a used vinyl shop, so until these are reissued, I guess it's the only way. Try www.gemm.com. 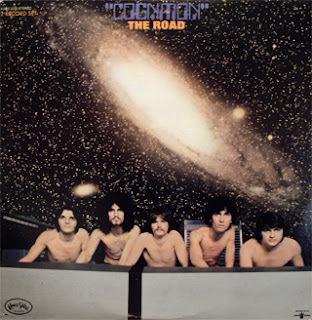 I saw the Road play at the local high school in Jamestown NY, I guess when this album was current, because I was 15 or so, just around 1970, 71. I knew the band was coming, and found a copy of their first album, the mostly covers album, in the cut-out bin at Woolworths for about 50 cents. I couldn't believe that the band was going to play a concert in town and Woolworth's had their album for a couple quarters. I later got this album and still have both. That was my first-ever rock concert, at the high school auditorium. My dad had to drive my friend Rod and me to the show and pick us up after. What a night. They really jammed, I rememver. I used to see The Road quite a bit at local clubs around Buffalo. Those were amazing times for local bands! Weekend, Talas, and The Road were my favorites, unless I was in a John Valby mood. I copied both albums by The Road from vinyl to CD-R and I made MP3s from those. 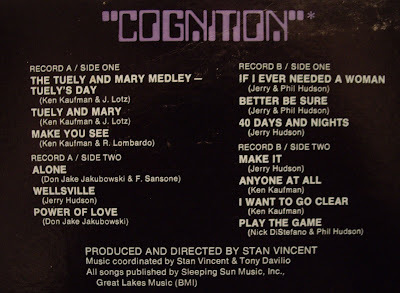 For some reason I still have one copy left of the Cognition album but their 1st LP was sold off as I unloaded my record collection. I have a couple singles around here somewhere, and I believe one includes a non-LP B-side titled "A Bummer". The ol' emory isn't what it once was, but I recall seeing The Road perform the Cognition album in its entirety at a free concert in Delaware Park. Love to have THAT on video! I first saw The Mellowbrook Road (first name of the group) in 1968 (I think) in Orchard Park, NY at "JB's Pendulum for Swinging Teens" Wow does that bring back memories and make me feel old. It was a teenybopper club. The Road was great and I followed their career throughout the next few years. I have both albums, Cognition and The Road.